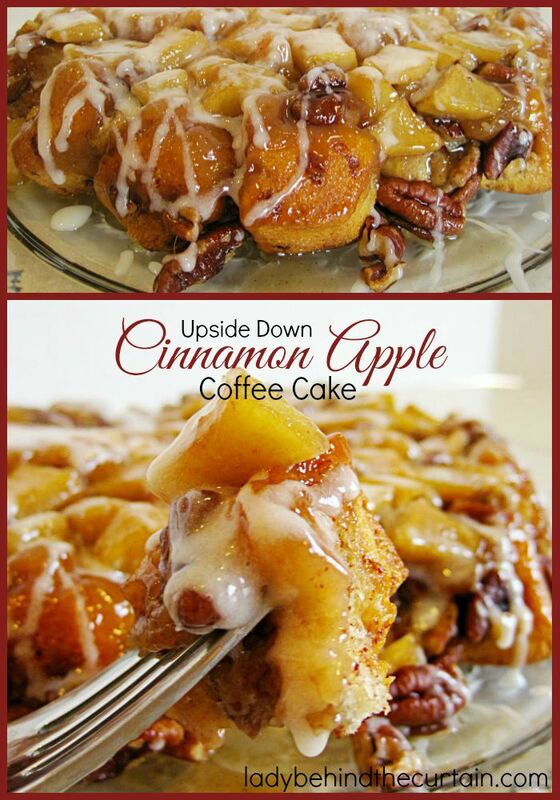 Upside Down Cinnamon Apple Coffee Cake | This gooey easy breakfast treat is made with store bought cinnamon rolls. The perfect weekend breakfast. Tasty and easy! 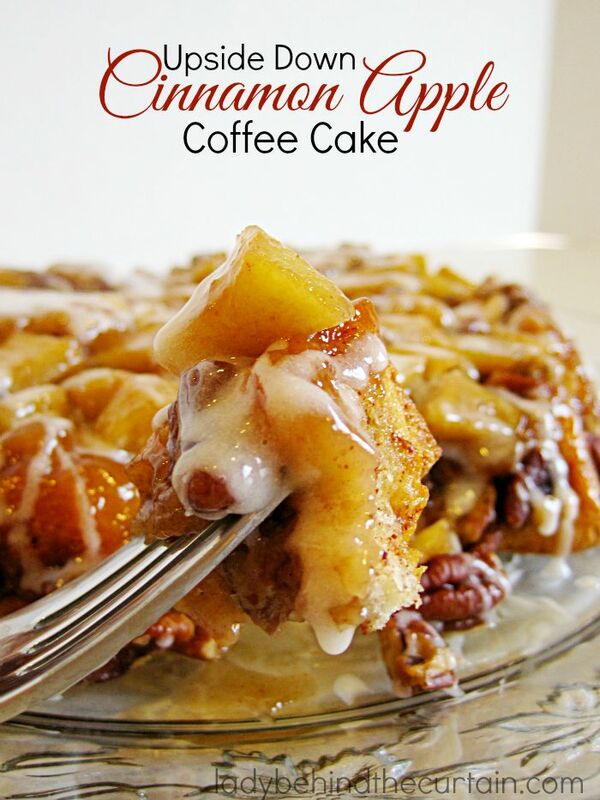 This Upside-Down Cinnamon Apple Coffee Cake recipe is so easy to make! By the time your oven has preheated you are ready to put the coffee cake into the oven. Nice and gooey with plenty of pecans and apples it’s just as good re heated in the microwave. A GREAT Sunday morning breakfast, perfect breakfast to serve out of town guests and to serve at your next brunch. I loved this recipe! I didn’t have apples, I had fresh peaches. Also, I had orange cinnamon rolls with orange flavored icing. I thought, hmmm… this might work. It worked great! OMG, this tasted sooo yummy, and while I was preparing it, somehow a little of the orange icing got into my cup of coffee. Thanks to you, I would’ve never thought of making this heavenly breakfast treat! Wow Renay! That sounds awesome! That looks so yummy, easy and delicious. My kind of recipe. Come over and visit. We have a wonderful Southern treat to share. Wow!! that looks fantastic and EASY~ right up my alley!!! Um…this looks and sounds F-A-N-T-A-S-T-I-C!!! oh my god, these look so yummy! Looks absolutely wonderful. oh wow….this looks absolutely scrumptious…can’t wait to try it out! Oh yum!!!! This does look so easy. I can’t wait to make it for my bible study group! Thanks for sharing and linking to TMTT. Wow, these look so sinfully delicious…all gooey and sticky. My husband would love these, so I’ll definetly be trying them. Thanks for the recipe. Great pictures. Come by for a visit sometime, would love to have you. This looks so good, sweet and easy! Sunday morning with a glass of iced tea. Wow…that looks good and so easy! I bet the house smells wonderful too! Mmmm! Oh my gosh, how decadent and delicious! Thank you so much for joining Fat Camp Friday! See you next week! One of my favorite flavor blends – apples and cinnamon! Looks like the perfect breakfast pastry. Thanks for sharing on Sweet Indulgences Sunday. Oh my gosh! This looks DIVINE! I am featuring this on my blog today for Mouth-Watering Monday! Come check it out and feel free to grab a featured button! Oh my!!! That looks so rich and wonderful! Thanks for linking up on Recipes I Can’t Wait to Try! This looks and sounds so delicious! I think it would make my husband happy! oh my they sound so wonderful, I can’t wait to try this recipe, I cook for a summer family and I am going to save this for them for one of their Brunches or Breakfasts when they get back. Thank you so very much for sharing! Thank you for this recipe! I made it for brunch today and it was devoured! So delicious, and pretty easy to put together too! Made this for work today!! It was an absolute hit! The only addition I made was adding about 1/3 a cup of raisins. Delicious! I did the same. Added golden raisins. Turned out wonderful! I have just featured your awesome Coffee Cake on my Face Book page, thanks so much for sharing with Full Plate Thursday! This looks amazing! Can’t wait to make it soon. Wow that coffee cake looks good! I’ll be making it for Sunday breakfast and sharing a link to your post on my FB page this weekend. Pinning it too. Thanks. Thanks for bringing this wonderful recipe to Foodie Friends Friday! YUM! This looks easy and so good. Thanks for sharing! This looks delicious and I think I have all the ingredients at home. May just have to make it when I wake up today to bring as a treat for my co-workers tonight. Thanks for sharing on Foodie Friends Friday. Just a quick note that I’ve included a link to this post in my “What We Ate” blog this week. The upside down cake was our Sunday breakfast. It was very good! Holy cow, I want some of this right now! If I may, I’d like to invite you to submit your photos to the new YumGoggle, a photo sharing site with the philosophy that if you worked hard to cook it and photograph it, we should show it off! Hope to see you there soon! What are the best apples to use? This looks SOOOO GOOD!! I WOULD LIKE TO TRY PEACHES IN THE UPSIDE DOWN CAKE, BUT IT DOES LOOK GREAT…..
Wow, this looks mouthwatering! I have pinned and can’t wait to make this when apple season is in full swing! I would love for you to stop by and link this up with me this week! Awesome! I just took it out of the oven and it smells yummy! I added some dried cranberries to the mixture. This looks amazing! Do you think it would work to assemble the night before, and then bake in the morning? Oh my goodness Sheryl….this looks amazing! So ooey and gooey and delicious! Perfect for company! What a gooey, delicious dessert! Pinning and sharing! Can this be made in a bundt pan? I’m so excited to make this!!! You can….I would double the recipe if you do. Do you add the remaining apples and pecans to the pie plate or the dough? HELP! First time reading your recipe blog…fabulous ideas. 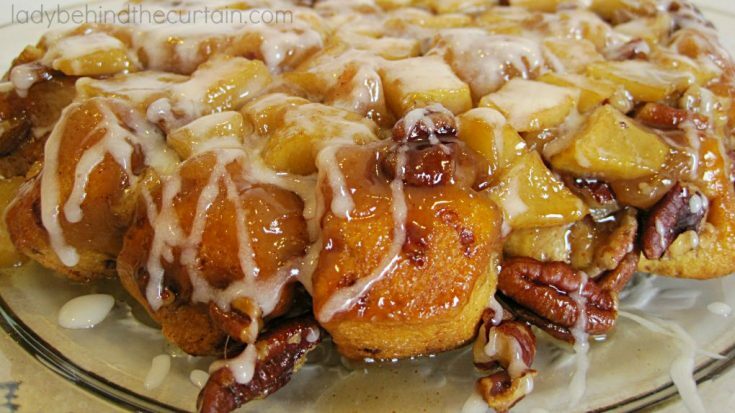 I will definitely try this apple cinnamon delight soon. This looks fantastic!! I have some fresh cranberries that would go well with the apples, too. I bet you could use all sorts of fruits in this – even bananas would be sort of “Foster-ish”. A new recipe for my repertoire! Thanks! How long before it’s going to be eaten can it be prepared? Hi Julie, I would say this cake is best right out of the oven.